Shopping for a new computer can be frustrating, especially if you’re on a budget and not looking to spend a lot of money. It also can be quite confusing, with there being a lot of specifications to think about — be it RAM, storage, or processing power. Not to worry, though, as we’ve got your back. We’ve sorted through the web and below are the best laptop deals available for April 2019. Our picks cover everything you can think of — 2-in-1s, MacBooks, Chromebooks, and more. Acer might be known for its Chromebooks, but this brand built its name on its affordable Windows laptops like the Aspire series. The 15-inch Acer Aspire E 15 is the perfect entry-level work computer, running on an eighth-generation Intel Core i3-8130U CPU, 6GB of RAM, and a 1TB hard drive. It also can be upgraded easily. Just pop open the bottom of the laptop and add extra RAM as well as faster solid-state-drive storage if you see fit. At $330 on sale from Amazon – it is around the same price as (or even cheaper than) many of the best Chromebooks. Want a compact and convertible Chromebook? The Samsung Chromebook Plus is a great way to start. Unlike most cheap Chromebooks which feature slower Intel Celeron processors, the Samsung Chromebook Plus comes configured with the Intel Core m3 Processor and 4GB of RAM. This makes it quite good for web browsing and light multitasking. It also comes with the convenience of the Samsung S Pen built right in, allowing you to draw images, take notes, and more. Though not as affordable as most Chromebooks on our list, it is currently priced at $493 at Amazon, a savings of roughly $105. It still is well within our budget range and is plenty valuable for under $600. Dell has built its reputation on solid, no-nonsense, and affordable Windows computers. Its Inspiron lineup is all about bringing affordable prices to the masses, and the Inspiron 15 5000 is a great way to start. This version comes equipped with an 8th-generation Intel Core i5-8250U processor, a 1TB hard disk drive, as well as 8GB of RAM. While it isn’t the thinnest or lightest laptop you can buy from Dell, the specs make it an excellent option for most looking for a first-time or business computer. Usually retailing for around $778, Dell’s deal brings the price of the laptop down to $600. Seeking a cheap, but sleek and light 2-in-1 with a large 15-inch screen? The Lenovo Flex 15 is for you. Under the hood, the device is powered an eighth-generation Intel Core i5-8250U processor, 8GB of RAM, and a 256GB solid-state drive. Since the Flex 15 is fully convertible, you can use it in either laptop, tent, stand, or tablet mode and get an immersive experience when watching movies. You also can purchase the Lenovo Active pen, and draw in the screen or write on PDF files. The Flex 15 currently on sale for $594 as part of Lenovo’s Spring sale. Microsoft’s excellent Surface Pro series continues to be one of the best attempts at bridging the gap between tablets and laptops. The new Surface Pro 6 is actually our favorite 2-in-1 Windows 10 computer on the market today, but the older Surface Pro model from 2017 is still a great option. It features super-solid build quality and superb battery life. As great as the Surface Pro is, though, you typically have to buy the keyboard case separately (and it’s not really a “2-in-1” laptop without it). Luckily, Best Buy has the Surface Pro bundle on sale right now, letting you score this Windows 10 tablet/PC hybrid with a platinum-colored Type Cover keyboard case for $699 for the model with 4GB of RAM, a 128GB SSD, and an Intel Core m3 processor. This makes it a great entry-level device for basic web browsing and most day-to-day tasks. If you’re looking for a convertible 2-in-1 that works as well as a laptop as it does a tablet, then you need look no further than the HP Spectre x360 13. The latest “gem-cut” version scored a perfect 10/10 in our review on the strength of its stunning good looks, excellent performance, high-quality build, and mind-blowing battery life. The version we’re listing here has a lovely 4K display that might eat into battery life a bit but will give you an awesome Netflix bingeing experiences — to go with an 8th-gen Whiskey Lake Intel Core i7-8565U processor, 16GB of RAM, and a 512GB SSD. Best Buy has this lovely laptop on sale right now for $200 off, down to $1,350. Seeking a laptop with sleek bezels, and a thin and light design? The Asus ZenBook 13 is for you. Under the hood of this machine is the Intel Core i7-8565U processor, 8GB RAM, as well as speedy-fast 256GB M.2 solid-state drive. It features a thin and light magnesium-alloy design and measures in at just 0.5 inches thin. The 80-percent screen-to-body ratio also means you can get an immersive viewing experience from your movies and TV shows. Battery life is excellent and is at around 13 hours — enough to get you through the day on a single charge. Usually selling for $900, you can now find it on sale at B&H for $829. Deals on Apple products are hard to find, but recently the new 2018 MacBook Air has recently seen quite the amount of discounts. It now is again on sale at Amazon. The latest Apple laptop includes a 128GB solid-state drive, a dual-core Intel Core i5 processor, and 8GB of RAM. It also comes in three colors — silver, space gray, and gold. Compared to older MacBook Air models, this version features a high-resolution Retina display, as well as the efficiency of a modern Intel processor. In our review, we liked its thin and light design, as well as its build quality. An improved keyboard, trackpad, and TouchID support were also highs for us. Amazon’s deal is bringing the price of the MacBook Air down from $1,200 to $1,109. 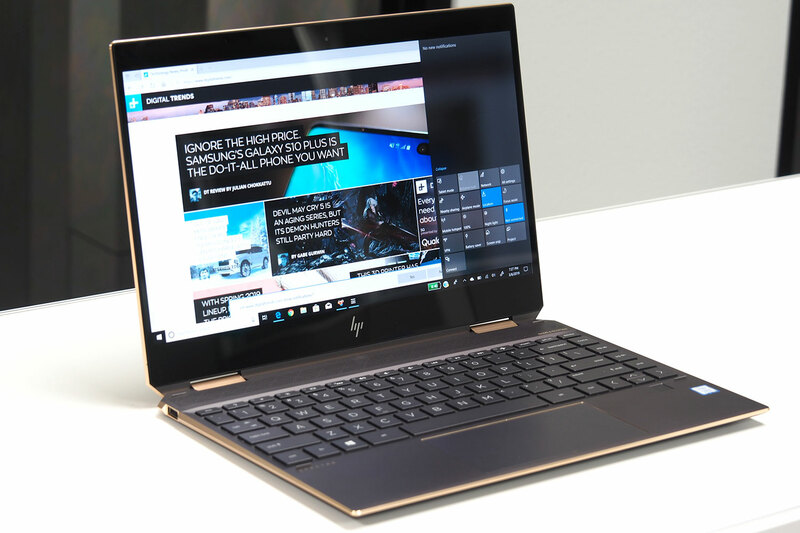 We linked to a great deal on latest version of HP’s excellent Spectre x360 13, the “gem-cut” 2019 model. That doesn’t mean the previous version isn’t worth considering, given its good looks, excellent build quality, and performance. And you can save some real money by stepping back a version. Here we have a version with an Intel Core i7-8550U processor and Intel UHD 620 integrated GPU, along with 16GB of RAM and a 512GB SSD, which remain great performers. The HP Spectre x360 13 (2018) touchscreen laptop can be yours for $1,129 instead of $1,430.